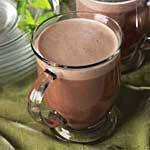 Mint Hot Chocolate Discounts Apply ! Treat yourself to a Mint Hot Chocolate. Tastes like Mint Chocolate at the high priced Coffee shops but loaded with 15 grams of protein! Easy to mix and goes great as a breakfast treat or nightime snack. Add a dab of whipped cream for a special treat. Hydrolyzed Gelatin, Calcium Caseinate, Non Fat Dry Milk, Cocoa Powder (processed with alkali), Maltodextrin, Natural and Artificial Flavors, Salt, Potassium Citrate, Titanium Dioxide, Sucralose, Soy Lecithin.